Bhubaneswar: The atmosphere in the premises of a Apollo hospital in the area had been full of terror and anxiety after fire suddenly broke on the fifth floor of the hospital’s building. As a precautionary measure, some patients had been shifted to other hospitals. According to media reports, fire suddenly broke out in the battery room of the Apollo hospital. The battery room was located close to the Intensive Care Unit (ICU). A hospital official informed about the smoke billowing out of the battery room on the fifth floor was noticed by some staff after which the fire service was informed and immediate steps were taken to douse the flame. The deputy fire officer, R C Majhi told PTI that on getting information of the fire in the battery room of the Apollo hospital near Gajapati Nagar area, fire tenders were rushed to the spot and they extinguished the flame completely within a short time. 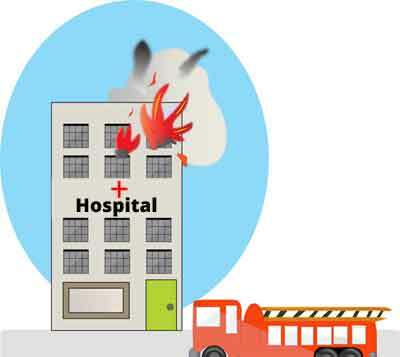 The fire was confined to the battery room and did not spread to other areas of the hospital as immediate steps were taken to suspend power supply, a hospital official said. The TOI reports that 26 patients were immediately shifted to other hospitals. Among them, two have been reported to be dead. However, the exact cause of death in both the cases is yet to be determined, the spokesperson of Apollo hospital said. Khurda collector Nirmal Chandra Mishra has formed a three-member committee to probe the cause of the fire. The committee will be headed by the additional district medical officer of Khurda, TOI reports. “We have set up an inquiry committee and its terms of reference have been given. The committee will submit the probe report by February 6,” he added.